CIAK STARTER with its CIAK STARTER line, the company C.I.A.K. has been the innovative leader in the battery offer for 20 years. We are the leaders in introducing on the market batteries that do not require any additional and subsequent maintenance after installation on your vehicle. Then the pioneer of the technology, today this is the part of the standard offer of the most serious battery manufacturers. It was then that the company C.I.A.K., with its visionary view on the future, brought innovative technology to their vehicles with the perfect value for money. 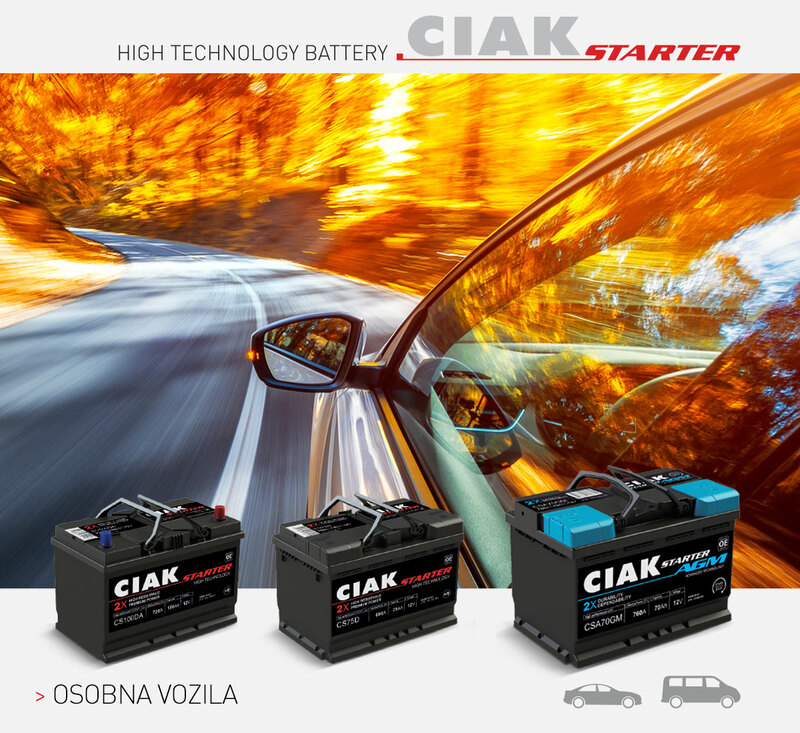 CIAK STARTER, in all battery models for personal vehicles programme, is made completely with the technology that does not require any maintenance after installation on the vehicle (Maintenance Free). In the world of consumption and technological progress, company CIAK is able to follow you as a social and environmental partner of healthy environment. Our activities reflect the needs of the market and our long experience in hazardous and non-hazardous waste management. We started with our first activities in 1995 with organized collection of old batteries and their treatment, followed by extension of activities to all hazardous/non-hazardous waste, as well as on all other activities related to environmental protection. CIAK d.o.o. manages around 30 000 tons of hazardous and nonhazardous waste annually and is experienced in managing ALL types and categories of waste. We specially stress out that CIAK d.o.o. possesses premises, equipment and staff for managing over 70 000 tons of waste annually.